It might be safe to say that out of the six Eastern Conference teams still in the hunt for the playoffs, the Boston Bruins have the most difficult schedule of remaining regular season games. The Bruins will first host the 9th seed Washington Capitals, just two points out of playoff contention before heading to New York for back-to-back games against the all-but-eliminated Islanders and a Rangers team which they’re winless against this season. After that, the Bruins will come back home to play the streaking Pittsburgh Penguins, travel to Ottawa to face the team chasing them for the Northeast Division lead and close out the season back in Boston against the Buffalo Sabres who are 7-1-2 in their last ten games. A bit daunting when you think about how inconsistent the Bruins have been at times during the season, eh? The good news is that the Bruins could potentially clinch a playoff spot in their next game with a win or overtime loss against Washington. The bad news is that the division, along with their potential first round opponent, is far from being decided. Pair that with some tough decisions that Boston coach Claude Julien will face regarding starting goaltending and resting key players and you have to think: this will not be an easy two weeks for the Boston Bruins. With reports out of Boston that Nathan Horton is likely out for the remainder of the season, the Bruins could already be without a key contributor for the postseason. Even without that being the case, it would be smart for Julien to start resting some players if this Bruins team is to go deep into the playoffs once again. Where do you start? That’s easy—with the largest man on the ice. Zdeno Chara has played in all but two games this season with the Bruins, logging an average of 25:01 per game in a shut-down defender’s role. With some key games coming up, it may not be wise for Julien to give Chara a rest until perhaps the final game or two of the season against the Senators or Sabres. Even then, can the Bruins afford to give their #1 defenseman a breather? With the playoffs coming up, the Bruins will have to if they want their captain to continue to record big minutes into the postseason. 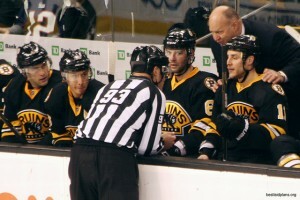 Julien will also have to consider giving Dennis Seidenberg a game off. The German-born defender hasn’t missed a game all season and is right behind the Bruins’ captain, playing an average of 24:05 minutes per game, second-most on the Bruins. The Bruins don’t want to overwork their top two defensemen early on and with plenty of depth in the defense position, Boston has the luxury to sub-in when necessary. As it is now, recent healthy scratches Joe Corvo, Mike Mottau and even newly signed Torey Krug should be expected to see some playing time in the next few games. The goaltending position will be trickier. Tim Thomas has already played in 56 games and is on pace for 60, his most since the 2006-07 season, the last year the Bruins missed the playoffs. Common sense says that Thomas starts Thursday with backup Marty Turco starting against the Islanders on Saturday and Thomas again on Sunday against the Rangers. After that, it becomes a mystery. Turco is ineligible for postseason play and with Tuukka Rask still sidelined with a groin injury, the backup goaltending position for the Bruins is set to become vacant just in time for the playoffs. Turco could still start another game to give Thomas the much-needed rest. However, if the Bruins needed to call-up a goaltender for the postseason from AHL-affiliate the Providence Bruins, it could be that Anton Khudobin or even Michael Hutchinson gets the final start of the year for Boston, if only for the NHL-experience. It’s less than ideal, especially with the Eastern Conference seeding still undecided, but if Rask isn’t ready in time for the postseason, what other choices do the Bruins have? Although Khudobin is coming off of a wrist injury, he’d be the most likely candidate to get the call-up. While he’s never started in Boston, he had a few impressive starts with the Minnesota Wild in years past. In six career NHL games, Khudobin is 4-1 with a 1.39 goals-against-average and .955 save percentage that included a 32-save shutout against, of course, the Vancouver Canucks. In Providence this season, he’s 21-17-4 with a 2.57 G.A.A. and .927 save percentage. The forwards are a different story. Julien could rotate recent healthy scratch Daniel Paille into the lineup in favor of Jordan Caron and could also call-up one of the many forwards in Providence. It wouldn’t be too much of a surprise to see Trent Whitfield, Carter Camper or even Zach Hamill back in Boston before the regular season concludes. As it stands now, the Providence Bruins are two points out of the playoff picture in the AHL. Julien will have to be careful to balance some of these delicate decisions over the next two weeks. Though it’s close, the Bruins still haven’t clinched a playoff spot yet, let alone the Northeast Division. The remaining six games are crucial for the Boston Bruins, both in how they play and with who’s on the ice.